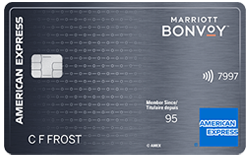 New Marriott Bonvoy™ American Express® Card Cardmembers earn 60,000 Marriott Bonvoy points enough for 4 free nights at a Category 2 hotel after you charge $1,500 in purchases to your Card in your first three months of Cardmembership. Receive 15 Elite Night Credits each calendar year with your Marriott Bonvoy American Express Card. These can be used towards attaining the next level of Elite status in the Marriott Bonvoy program. American Express is not responsible for maintaining or monitoring the accuracy of information on this website.